Nell Ranta is a Sacramento, California activist. Nell Ranta is a UNITE HERE retiree and longtime activist for home care issues. A Sacramento, California area resident, she has also been active in recent Unite Here! organizing activities. Ranta has been a reader and circulator of the Communist Party USA paper People's World and its predecessors for 60 years. 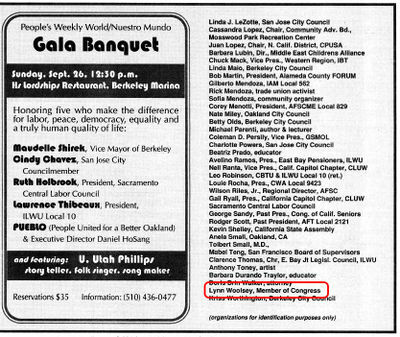 In September 1999, Nell Ranta, Vice president California Capitol chapter Coalition of Labor Union Women, co-sponsored a Communist Party USA fund raising event in Berkeley. Rep. Lynn Woolsey co-sponsored the same event. Nell Ranta phonebanked for Ami Bera in 2010. I have been phone-banking for Dr. Bera's campaign, and it's really an educational experience. Dozens of young people on the phones, out in the precincts, knocking on doors, organizing house parties, reaching hundreds of residents, inviting them to small house gatherings where participants can interact with the candidates. Many young activists have been trained through this experience. This has been a very successful part of his campaign. This page was last modified on 9 June 2018, at 04:12.